Other files with mail art by Ruud Janssen : 1 , 2 , 3 , 4 , 5 , 6 , 7 , most recent . 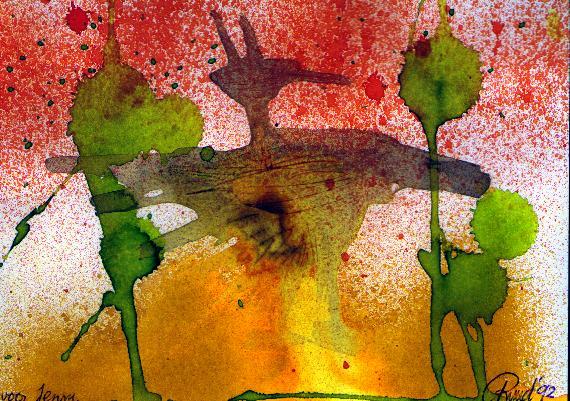 This page gives you an overview of some mail art pieces I have sent out. They are graphics from mail artists to whom I have sent my (snail-) mail art and they sent a digital copy back to me (or placed it on the Internet). Most of the images were captured with a scanner or a digital camera. 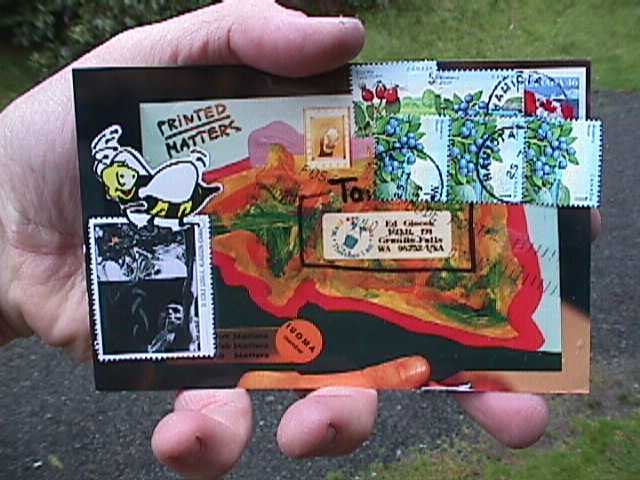 If you get a piece of mail art from me, I would welcome to get a digital copy of it. I will then add it to this growing documentation. I started this file in June 1998 because Ed Giecek (USA) was so kind to send me a digital photo of him opening the envelope I sent to him. 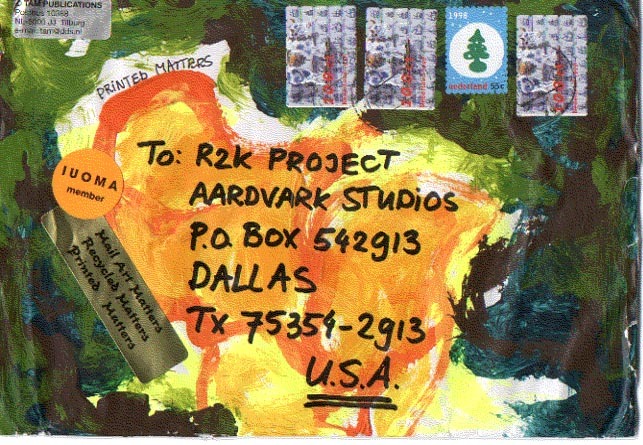 On July 5th 1999 I received from the Aardvark Studios (USA) the image below. It was the envelope I sent my contribution in to their R2K-project. 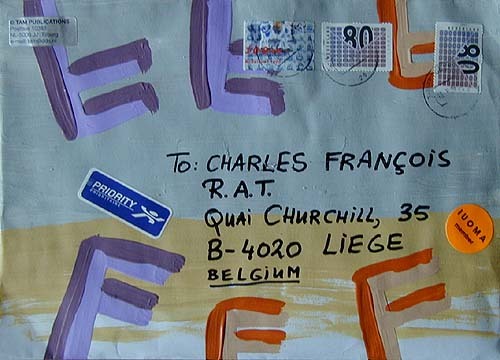 On June 24th 1999 I received the image (above) from Charles François (Belgium). A copy of an envelope I sent to Charles containing some of the latest mail-interviews. Again a digital image from Tim Mancusi (USA). 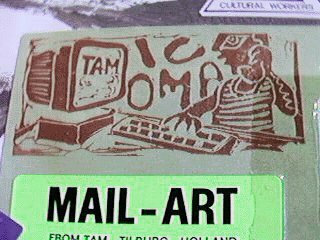 The colors come out a bit strange, but still, that is all part of this project where mail-artists are encouraged to digitize my outgoing snail-mail. I received the image on June 7th 1999. 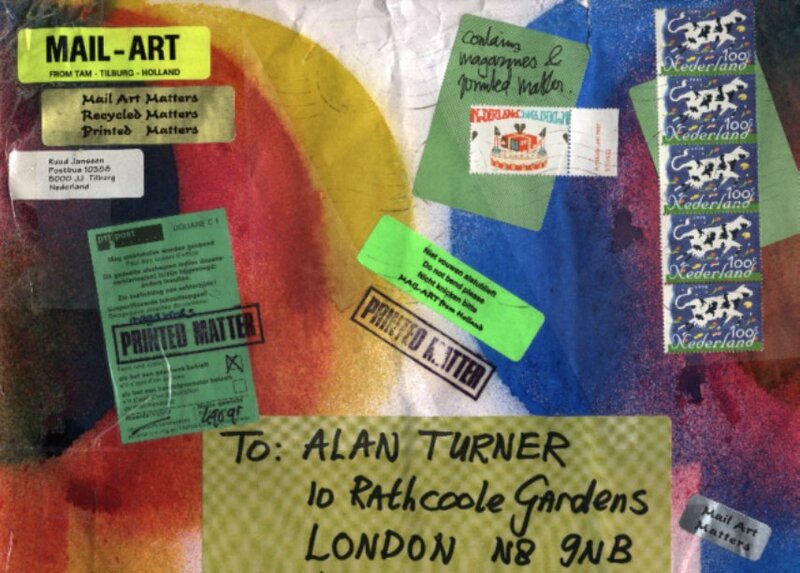 The above envelope was sent to Alan Turner (UK). Somehow I arranged it so I received a scanned image back of the envelope as a .TIF-file on March 26th 1999. I used some graphic software to transfer it into a .JPG-file and here you can see the result. Jenny de Groot (the Netherlands) has her own site as well. 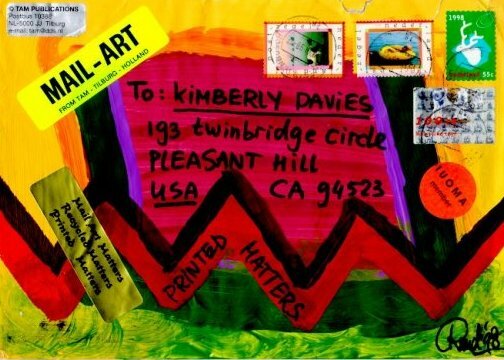 Recently she added a huge graphic database to it with lots of mail-art cards that she has received over the years. 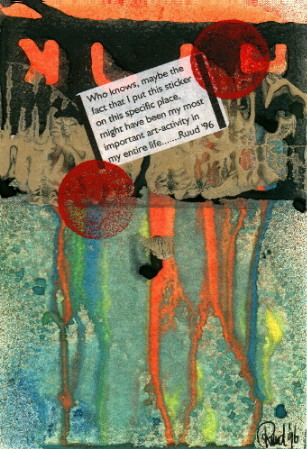 I found one of my own there as well, which I have now added to this selection of my mail-art. 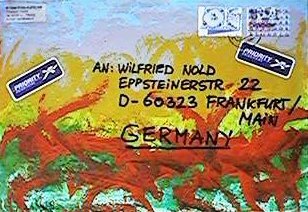 I sent the above envelope to Wilfried Nold in Germany. As normal I included the invitation which asks the receiver to make a digital copy if possible and to e-mail that back to me. Wilfried hasn't got these electronic possibilities, and so he returned the envelope. SInce I now have my own digital camera, I decided to make a photo of it myself. Whenever I send out acryl-painted envelopes I normally take a colour-photo of it to document the piece of art that is going away. Sometimes I even take two photos and mail one off to another mail-artists with the request to send the photo to the receiver of the envelope. 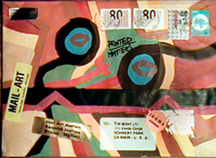 Ed Giecek was the receiver of the original envelope (see above) and Lois Klassen received the photo and made a collage with it on her mail to Ed. Looks kind of nice doesn't it. I received the digital image on March 3rd 1999. Lynniepoo (USA) , did her very best to make the image of my envelope to her so little as possible. She reduced the image to 32 kByte , so well beneath the 100 kByte I normally ask for. The image was received on February 19th 1999. 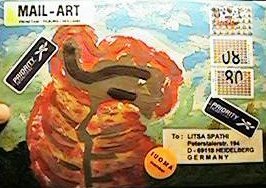 The above envelope was sent to Litsa Spathi (Germany) beginning February 1999 and was digitized before it was actually sent out. A.K. Ames (dragonfly from the USA) sent me two graphics she made with envelopes that she received from me (see above)the last months. If you receive a piece of snail mail from me and have a scanner or digital camera, I would welcome the digital file (via e-mail). 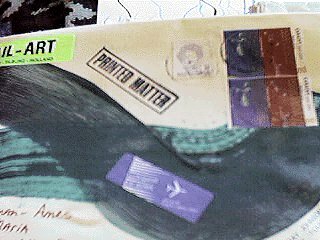 I will add the graphic to this list and mention the background of the piece of mail-art.